These beach themed cutter would be ideal if you’re having a wedding at the beach or on a boat, or if you just happen to have a nautical theme for your wedding (which seems to be really big right now on Pinterest). 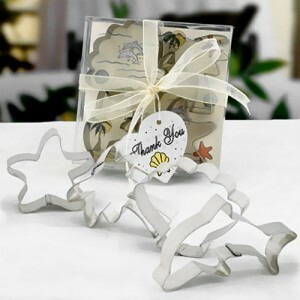 Each set of the beach-y cookie cutters come with a seashell, palm tree, dolphin, and starfish cookie cutter. The sets are gift wrapped and tied with an ivory ribbon. You can find these beach themed cookie cutters here.